Mayor of Newham, Sir Robin Wales, has wished The Queen a happy 90th birthday as she celebrates her official birthday today (April 21). If you are going embarrass yourself by kissing the royal arse in public, at least get it right. April 21 is the Queen’s actual birthday; her official birthday is in June. A leading campaigner against the use of LOBO loans by local councils has accused Newham of operating a deliberate policy of delay and frustration in relation to Freedom of Information requests. Please provide copies of Robin Wales’ Disclosure Forms for the 1995-2016 period and related ‘party transaction disclosures’ (which are related but not identical to the disclosure of interests forms members complete) which are required to be completed every year by the elected members. Please confirm the number of occasions upon which it was recorded Robin Wales withdrew from a Newham meeting, declaring a conflict of interest? Please confirm the dates upon which Newham Council has audited Members Disclosure forms and ‘party transaction disclosures’ between 1995-2016 to ensure member compliance. Please confirm on how many occasions, 1995-2016, Newham members have been cautioned, disciplined or otherwise sanctioned for failing to fill out a disclosure log, or for failing to disclose personal financial interests and potential conflicts? At the same time he submitted an identical request relating to councillor Lester Hudson, the cabinet lead for finance and chair of the audit board. I am writing to request an internal review of Newham Borough Council’s handling of my FOI request ‘Disclosure of Newham Register of Elected Members Interest Forms – Robin Wales’. I note that a formal response from Newham Council to this FOIA request is now approaching 20 days overdue, and is set against a backdrop of unexplained delays, refused requests and opaque decision making, which increasingly casts Newham Council as a FOIA non-compliant outlier for local authorities contacted for information regarding LOBO loans. Mayor of Newham Robin Wales has staunchly defended the use of LOBO loans by Newham Council, which have been shown to cost Council taxpayers a £10m interest premium over the past decade, to say nothing of the LOBOs taken out by Housing Associations indirectly under Newham control. It is therefore important to establish if conflict of interest forms have been formally lodged by Robin Wales and monitored by Newham Council and its auditors PwC for the period 2002 – 2011 when £653m of LOBO loan borrowing was negotiated. A review was also requested, in the same terms, of the unanswered questions about Cllr Hudson. I am writing to request an internal review of Newham Borough Council’s handling of my FOI request ‘Correspondence regarding Newham 2014/15 account objections re: LOBO Loans’. I note that a response to this FOIA request is now 2 weeks overdue, and joins 3 additional requests left unanswered by Newham Council, whose FOIA policy is clearly to defer, delay, frustrate in the hope that requesters will not bother with an internal review and subsequent ICO referral. Given failure to answer these FOIA requests is clearly part of a deliberate Newham policy and pattern, I will be referring the entire suite of unanswered FOIA requests to the ICO, and will let them determine the appropriate course of action to ensure that Newham Council administration acts in the public interest and the FOI officer observes the appropriate legal guidance timeframes. I know from my own experience that Newham has no regard for the law when it comes to freedom of information, and no respect for the public who are simply exercising their right to know what is being done in their name. They will delay, refuse or simply ignore any request that might result in political embarrassment for Sir Robin or his circle of friends. It is long past time that the Information Commissioners Office intervened. On the subject of local rail travel, the Goblin – the Gospel Oak to Barking line on the London Overground – will be closing in June for eight months. This will allow Network Rail to electrify the route. Once the work is done TfL plan to introduce new four-carriage electric trains to replace the existing two-carriage diesel units. This will double passenger capacity and relieve the dangerous overcrowding we currently endure during peak times, though not until early 2018. When the line re-opens it will initially be served by the existing, inadequate trains. TfL claims retraining drivers to use an alternative type of electric train for “just 11 months” until the new ones are delivered is cost-prohibitive. If you’re a regular user of the Goblin it will be well worth going along. On a related topic, the 2016 annual general meeting of the Barking – Gospel Oak Rail User Group will take place at 19:00 hours, concluding at 20:30 hours on Wednesday, 27th April in committee room 2 at Barking Town Hall, which is approximately a 5 minute walk from Barking station. More information about the group can be found on its website. Local campaigners and Forest Gate North councillor Seyi Akiwowo are calling on the mayor of London and the managing director of TfL to re-zone Maryland station. 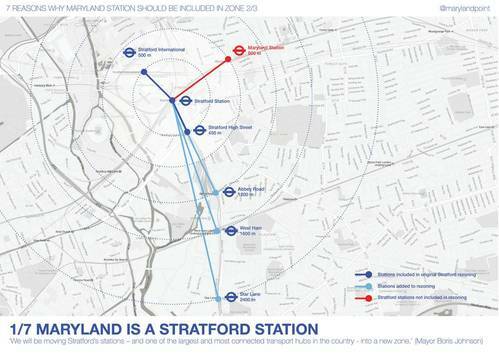 Maryland is the only station in the Stratford area not to have been re-zoned to 2/3 in January. Asa result residents, many of whom are on low incomes, could end up paying over £200 more this year to use their local station compared to those living elsewhere in the area. Newham continues to be one of the most deprived areas of the country with household incomes among the lowest in London and while the 100,000 weekly users of the eight re-zoned stations in the Stratford and Newtown ward now benefit from cheaper travel, those living in Maryland do not. We believe this is unfair and we are asking the Mayor and Commissioner of TfL to include Maryland station in zone 2/3. As a major transport hub Stratford station can get dangerously busy at peak times and with future residential and commercial development, including the exciting Olympicopolis scheme, set to bring thousands more people to the area the problem of overcrowding will only get worse. Maryland station is less than 10 minutes walk from Stratford, meaning it can help alleviate issues with passenger numbers, but will only do so if it offers a real and cost-effective alternative for those living and working in the east side of Stratford. Lyn Brown MP has already given her support and we are looking to Newham Council to include this as one of their priorities in 2016/17. We have also written to the London Mayoral and the City and East London Assembly candidates for their backing. By supporting this petition you are helping the hard working individuals, families and businesses who want to use their local station without being penalised for doing so. I’ve signed the petition and would urge readers to do the same. The Mayor of London and the London Assembly Member candidates have been officially announced. The candidates on each party list can be found on the London Elects website.